The Correale Museum is due to the munificence of the Correale Counts, who gave the beautiful villa and the park surrounding it as well as the precious collections. The museum has an archeological section on the ground floor, in which there are Greek, Roman and Byzantine marbles, among which is the important Base of Augustus (sacrificial altar of a statue of the Augustan age). In the two upper floors are collections of furniture, pictures, ceramics, clocks, shepherds for cribs and 17th and 18th century Neapolitan porcelain. 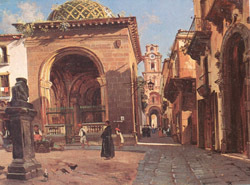 Various rooms are devoted to the School of Posillipo, with paintings by Pitloo, vianelli, Duclère, Gigante and some of the most representative painters of the 19th century Naples. The visit to the Museum gives one a magnificent idea of the development of Neapolitan decorative arts. Outside the villa, a stone commemorates the illustrious foreigners who have celebrated the beauty of Sorrento.